Professor J.H.P. 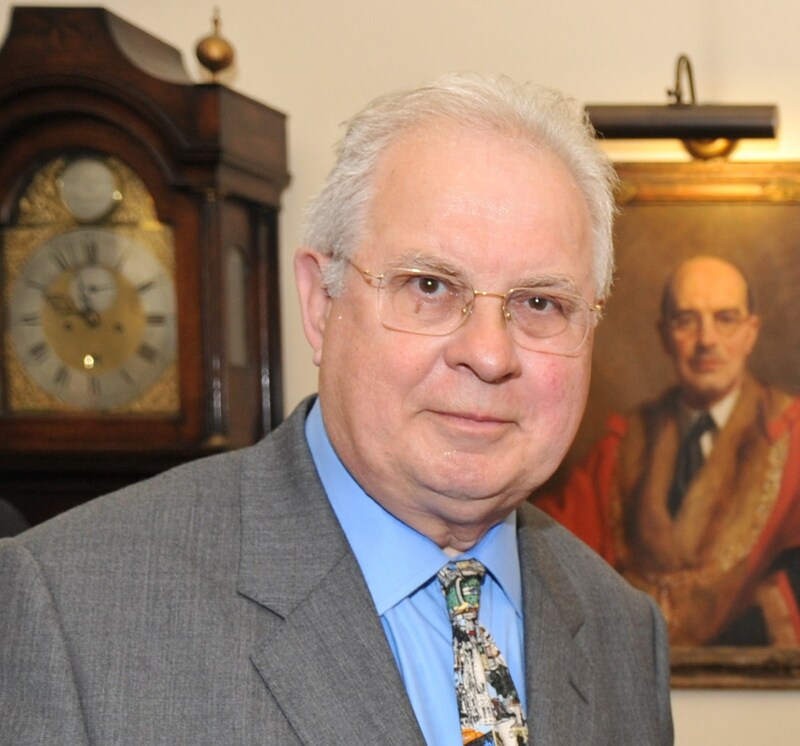 Utley, BSc PhD DSc (Lond) CChem FRSC : is an Emeritus Professor in Organic Chemistry and until October 1st 2001 held the established Chair of Organic Chemistry in the Department of Chemistry at Queen Mary, University of London. Professor Jim Utley has acted as Head of Chemistry (1987-91,1997-99), as Dean of the Faculty of Natural Sciences (1991-94) and as a member of College Council (1991-94). He has held positions as Professeur Invit� at the Ecole Normale Sup�rieure, Paris, (1995) and as Guest Professor at the Universities of Texas at Austin (1995), Westf�lischen Wilhelms-Universit�t, M�nster (1985) and of Aarhus (1973). He was the recipient, in 2000, of the 4th Manuel M. Baizer Award of the Organic and Biological Division of the Electrochemical Society (US). Citation, "In recognition of outstanding research contributions in the field of organic electrochemistry". Research areas: Organic electrochemistry applied to synthetic methodology and the study of reaction mechanisms. Professor Utley's research is mainly concerned with reactive intermediates which may be generated electrochemically. The advantages of this approach stem from the non-thermal activation and the clean (minimum reagent) conditions. Because activation is by electron transfer at ambient temperatures difficult processes can be driven under chemically mild conditions. And because oxidation and reduction is achieved without chemical reagents the processes can be environmentally friendly ("clean synthesis"). These aspects are attracting much current attention both nationally and worldwide. Advances in reactor engineering also mean that promising reactions may usually be scaled up for industrial use. Professor Utley no longer supervises researchers but he acts as a consultant and collaborates with colleagues on matters of electroorganic chemistry. Structure and reactivity of lignins, especially with regard to oxidative conversion. Representative published work; topics 1-5 above. � Utley J H P; Little, R. D.; Nielsen, M. F. Reductive Coupling. In Organic Electrochemistry, 5th ed. ; Hammerich, O., Speiser, B., Eds. ; Taylor and Francis: 2013. � Utley J H P; Wyatt, P. B.; Nielsen, M. F. Electrogenerated Bases and Nucleophiles. In Organic Electrochemistry, 5th ed. ; Hammerich, O., Speiser, B., Eds. ; Taylor and Francis: 2013. � Hammerich, O.; Utley J H P; Anodic Substitution and Addition. In Organic Electrochemistry, 5th ed. ; Hammerich, O., Speiser, B., Eds. ; Taylor and Francis: 2013. � Eru, E.; Hawkes, G. E.; Utley, J. H. P.; Wyatt, P. B. Electroorganic Reactions .41. Diels-Alder Reactions of O-Quinodimethanes from the Cathodic Reduction of Alpha,Alpha'-Dibromo-1,2-Dialkylbenzenes. Tetrahedron 1995, 51 (10), 3033-3044. � Utley, J. H. P.; Gao, Y. P.; Gruber, J.; Lines, R. Electrochemical Route to Xylylene Polymers and Copolymers Via Cathodically Generated Quinodimethanes - Preparative and Structural Aspects. Journal of Materials Chemistry 1995, 5 (9), 1297-1308. � Utley, JH P; Gruber, J. Electrochemical synthesis of poly(p-xylylenes) (PPXs) and poly(p-phenylene vinylenes) (PPVs) and the study of xylylene (quinodimethane) intermediates; an underrated approach. J. Materials Chem.� 2002, 12, 1613-1624. � Janssen, R. G.; Utley J H P; Carre, E.; Simon, E.; Schirmer, H. Electrorganic Reactions. Part 55.� Quinodimethane Chemistry. Part 3. Transition metal complexes as inter and intra-molecular redox catalysts for the electrosynthesis of poly-p-xylylene (PPX) polymers and oligomers. J. Chem. Soc., Perkin Trans. 2 2001, 1573-1584. Stereoselectivity and mechanism in the electrohydrodimerisation of esters of cinnamic acid. Journal of the Chemical Society-Perkin Transactions 2 1996, (4), 649-658. � Utley, J. H. P.; Gullu, M.; De Matteis, C. I.; Motevalli, M.; Nielsen, M. F. Electroorganic Reactions .45. the Highly Stereoselective Electrochemical Hydrodimerisation of Methyl 4-tert-Butylcyclohex-1-Enecarboxylate. Tetrahedron 1995, 51 (43), 11873-11882. � Sopher, D. W.; Utley, J. H. P. Alkene Formation in the Cathodic Reduction of Oxalates. Journal of the Chemical Society-Chemical Communications 1981, (3), 134-136. � Ellis, K. J.; Islam, N.; Smith, C. Z.; Sopher, D. W.; Utley, J. H. P.; Chum, H. L. Approaches to the Electrochemical Cleavage of Carbon-Oxygen Bonds. Journal of the Electrochemical Society 1984, 131 (3), C105. � Riley, J. H.; Sopher, D. W.; Utley, J. H. P.; Walton, D. J. Electroorganic Reactions .21. the Formation of Alkenes and Alkanes from Pinacols - the Electrochemical Cleavage of Cyclic Carbonates and Aryl Boronates. Journal of Chemical Research-S 1982, (12), 326-327. � Utley, J. H. P.; Ramesh, S. Electroorganic Reactions. Part 58. Revisiting the cleavage of oxalate ester radical-anions, Arkivoc 2003, 18-26. � Pardini, V. L.; Smith, C. Z.; Utley, J. H. P.; Vargas, R. R.; Viertler, H. Electroorganic Reactions .38. Mechanism of Electrooxidative Cleavage of Lignin Model Dimers. Journal of Organic Chemistry 1991, 56 (26), 7305-7313. � Smith, C. Z.; Utley, J. H. P.; Hammond, J. K. Electro-organic reactions. Part 61. The electro-oxidative conversion at laboratory scale of a lignosulfonate into vanillin in an FM01 filter press flow reactor: preparative and mechanistic aspects, Journal of Applied Electrochemistry 2011, 41 (4), 363-375. � Alonso, A. M.; Horcajada, R.; Motevalli, M.; Utley, J. H. P.; Wyatt, P. B. Electroorganic Reactions Part 60. The reactivity, as electrogenerated bases, of chiral and achiral phenazine radical-anions, including application in asymmetric deprotonation. Organic & Biomolecular Chemistry 2005, 3 (15), 2842-2847. � Generation of strong homochiral bases by electrochemical reduction of phenazine derivatives, A. Mateo Alonso, H. Groombridge, R. Horcajada, R. Mandalia, M. Motevalli, J. H. P. Utley and P. B. Wyatt, Chem. Commun., 2004, 412 �413. � Bettencourt, A. P.; Freitas, A. M.; Montenegro, M. I.; Nielsen, M. F.; Utley, J. H. P. Kinetics of proton transfer from phosphonium ions to electrogenerated bases: polar, steric and structural influences on kinetic acidity and basicity. Journal of the Chemical Society-Perkin Transactions 2 1998, (3), 515-522.